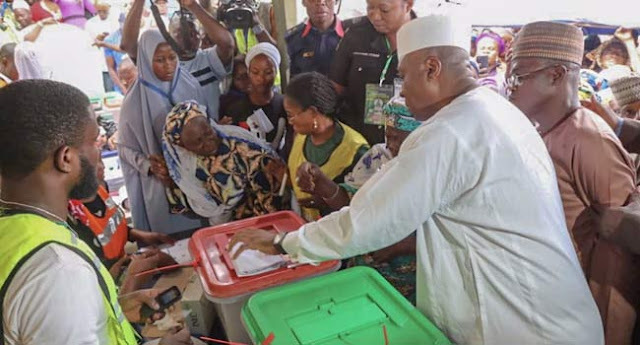 Senate President, Dr. Bukola Saraki, has said the turnout of voters for the presidential and National Assembly elections in Kwara State was impressive. Saraki spoke while addressing journalists after voting at Ode Opobiyi polling Unit (005/006), in Ajikobi ward, Ilorin West Local Government. He was accompanied by his wife, Toyin; mother, Mrs. Florence Saraki and eldest son, Seni at 10.20am. While commending the peaceful election, he urged the voters to remain patient to enable them cast their vote within the stipulated time frame. Sarahi however worried about the late arrival of voting materials in some polling units within Ilorin metropolis. He called on the Independent Electoral Commission to address such anomalies in subsequent elections.